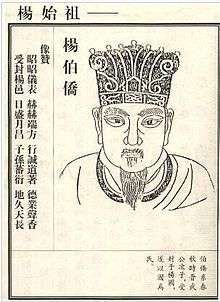 The Yang state was conquered by the Jin state during the reign of Duke Wu of Jin, and ancient lands of the Yang state were given to one of his sons named Ji Boqiao (姬伯僑) at 13th years old. With the conquest of the Yang state, many people of Yang (楊) and descendants of Boqiao eventually took the name of their former country as their family name, and account for the majority of Chinese people with the family name Yang today. ↑ Bamboo Annals, "Annals of Wei". ↑ Schirokauer, Conrad; Brown, Miranda (2006). A Brief History of Chinese Civilization (Second ed.). Wadsworth: Thomson Learning. ↑ Han, Zhaoqi (2010). "House of Jin". Annotated Shiji (in Chinese). Zhonghua Book Company. pp. 3093–3094. ISBN 978-7-101-07272-3. ↑ "Yang Family History". Retrieved 28 March 2014.